Coloured diamonds come in a wide range of colours. The SSEF report number is the number given to the coloured diamond when it is submitted for testing, and is a unique number. If an item is resubmitted later for a ‚recheck‘ after re-cutting or for a report update then the item obtains a new report number. The photo of a coloured diamond depicts the gem at the time of testing. The photo on an SSEF report is for representational purposes and does not necessarily represent actual colour, clarity or size. For size comparison purposes, approx. magnification used is provided under the photo on the report. Weight of a loose coloured diamond in carats, measured and stated with 3 digits. The shape and cut describe the outlining shape and cutting style of an examined coloured diamond. The measurements are given at 2 decimal places. They generally represent length x width x height of a coloured diamond. Clarity grading of coloured diamonds is an optional service offered by SSEF. 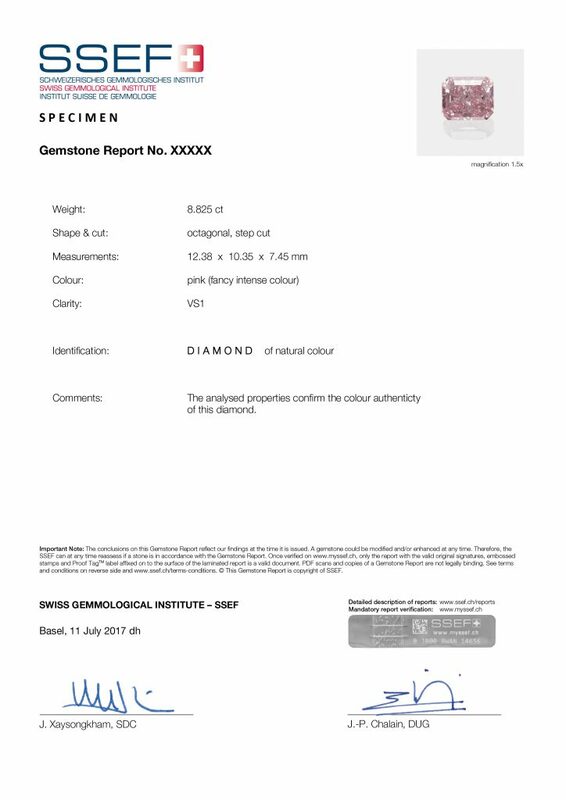 A coloured diamond of natural colour is identified as a ‘Diamond of natural colour’ on an SSEF report. The comments section confirms the colour authenticity of a tested coloured diamond, if analysis permit this.